The Sistine Madonna is an oil painting depicting the Virgin Mary holding the baby Christ child in her arms. Her face as she looks into his appears worried as it does in the painting of the crucifixion. Beneath her are two cherubs resting on their elbows and gazing up at the Virgin Mother. Mary, surrounded by the benevolent Saints Sixtus and Barbara, stands on clouds in front of numerous concealed cherubs. The Sistine Madonna was created by Raphael Sanzio da Urbino just a few short years before the artist’s death in c. 1514. It was the last painting to be completed by his own hands and was painted for the Benedictine Monks of the San Sisto Monastery Piacenza. It was the Monks direct request that the painting have both the aforementioned Saints in the painting with the Virgin Mary. Upon completion of this magnificent work of art it was hung near the Monk’s alter. It is said that when Antonio da Correggio first saw the painting he was moved to tears as have been many others since its completion. 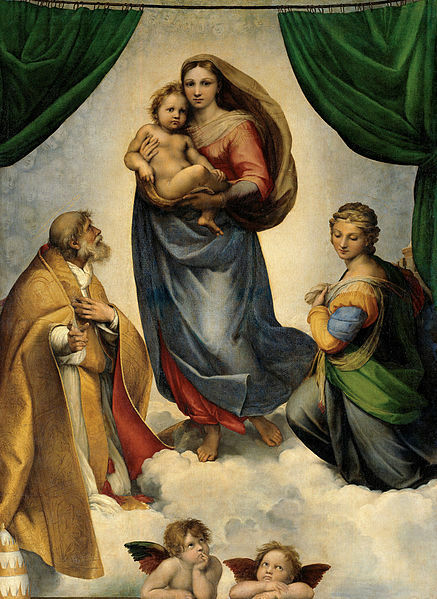 In 1754, the Sistine Madonna was purchased by the King of Poland; Augustus III and was relocated to Dresden Germany where it regained renewed recognition. It is written that the King of Poland was so moved by the image that he moved his throne to better show the masterpiece to the people. This spiked the German’s passions and created a division of sorts as to whether the piece was in fact art or religion. During the Second World War it became necessary to move the painting to Switzerland until it was taken in 1946 by the Russians who in 1955 returned it to Germany as an act of joining forces with the German people. Following the painting’s return to Germany, it was restored and displayed in the German Art Gallery where it has been touted as being the most famous painting of all. “to move the painting to Switzerland” this is wrong. The painting was moved somewhere in the “Sächsische Schweiz” (Swiss Saxony) which is an area south of Dresden, not at all in Switzerland. To the locals this region appears to make them think of Switzerland (not to me, a Swiss citizen currently living in Dresden) as it is a somewhat hilly region. Today this region is stradling the border between Germany and the Czech Republic, quite a distance from Switzerland indeed, at least on the European scale. Living in Dresden I have seen this painting many times in the Gemälde Galerie Alte Meiter where it is hanged again. Each time I see it, it feels me with emotions. A unique masterpiece definitly!